The Genesis brand is on the right path, now let's see an N model. Last week we learned that Genesis was planning to reveal its BMW 3 Series rivaling sedan on the company's home turf of Seoul. We think that Frankfurt would have been a better place for such an important reveal, but the long-awaited Genesis G70 is finally here. Right off the bat, we think that Genesis nailed it with the styling. The G70 is more restrained than the Kia Stinger (on which it shares a platform), yet more adventurous than an Audi A4 or BMW 3 Series. The G70 looks ready to do battle with the best of the premium sedan segment. In the US, the G70 will share its engine choices with the Kia Stinger. The base engine will be a 2.0-liter inline-four with 252 hp and 260 lb-ft of torque and an optional twin-turbocharged 3.3-liter V-6 with 365 hp and 376 lb-ft is available. Genesis notes that these numbers are subject to change slightly, and will be confirmed closer to the car's sale date in March or April of 2018 as a 2019 model. Both engines will be available in RWD or AWD with a limited-slip differential as standard, which is a great way to win over enthusiasts. The G70 will share its eight-speed automatic with the larger G80, although Genesis has teased a very special treat for US buyers. Genesis says that it may include a manual transmission on the base 2.0-liter engine only for the first model year. This is thanks to the company's US division that requested this combination. We know that former BMW M head Albert Biermann had a lot to do with the sporty nature of this car. The 3.3-liter model with AWD will reportedly shift most of the torque to the rear wheels in pursuit of more driving fun. Biermann says "It probably wouldn’t be in the car without me.” The G70 also has an advanced chassis with five modes. These include Smart (auto), Normal, Custom, Eco, and Sport. These affect steering weight, throttle calibration, engine note, shift points, dampers and AWD settings. Every G70 will come standard with launch control and a brake-based torque vectoring system. This system can brake the inside wheel to help the car rotate through corners. The AWD system sends 100 percent of its power to the rear wheels by default, then adds power to the front as needed. The more powerful 3.3-liter model will be able to hit 62 mph in 4.7 seconds and go on to a top speed of 168 mph. The interior of the G70 features a driver-focused cockpit with a very Audi-like design. The G70 comes standard with goodies like Apple Car Play and Android Auto as well as a host of safety features. Genesis Active Safety Control includes forward collision avoidance assist (FCA), highway driving assist (HDA), blind spot collision warning (BCW) and driver awareness warning (DAW). In addition to all of the safety features, the G70 has a host of sweet tech options. For example, the G70 will have the G90's smart posture control system, which can automatically adjust the seats, steering wheel, mirrors and heads up display to the optimal position. The cabin color options are Obsidian Black, Sandstorm Gray, Velvet Burgundy, Tobacco Brown and Vanilla Beige, with two additional interior colors (Sports Gray and Sports Red) for the 3.3-liter model and top-trim 2.0-liter model. These interiors should pair well with the ten available exterior colors, Platinum Silver, Carbon Metal, Marble White, Titanium Black, Racing Gray, Graceful Gray, Lapis Blue, Royal Blue, Blazing Red and Umber Brown. All of the materials used inside the car are top notch, including Nappa leather seats. Wood is not available, although real aluminum is an option as are quilted and perforated leather seats. The cabin doesn't do too much to stand out in our opinion, but looks right in line with other models in this segment. Drivers will also have the option of a 15-speaker Lexicon surround-sound system, if they want the audiophile experience. We have been waiting a long time to see the first home grown car from the Genesis brand. 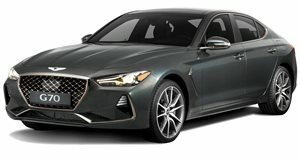 Both the G80 and G90 used to be Hyundai models, but the G70 is all Genesis. Now that the car is here, we have high hopes for the new luxury marque. A twin-turbo V8 G70 N is just what Genesis needs to make people forget all about AMG and M. The G70's shape is very conducive to a performance variant, and we have high hopes that Genesis will be able to deliver.